$15 Wins in Los Angeles – St Louis Next? 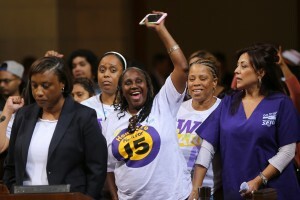 Workers in Los Angeles, the largest city on the West Coast and the second largest U.S. city overall, have secured a major victory in the fight to raise the minimum wage. On June 14, Democratic Mayor Eric Garcetti signed into law a wage increase to $15 an hour that will impact 800,000 workers. The victory in Los Angeles is a watershed moment for working class people across the country. Los Angeles is not only the largest American city to win $15, but also a big city with one of the highest rates of poverty in the country. One study estimated that in Los Angeles County, which includes L.A., fully 27% of the population lives below the official poverty line. By the time the increase is fully implemented, it will directly improve the wages of an astonishing 39% of the city’s workers. The national movement for $15 has created a rapid shift in public opinion, especially in major cities and has led to growing demands for change from progressives, low-wage workers, people of color, and union members. As a result, a number of Democratic politicians in big cities have taken up the $15 minimum wage demand to appease their voting base. The political situation in Los Angeles demonstrates this rapid shift, as Democratic Mayor Eric Garcetti pivoted to support $15 an hour, instead of $13, shortly after the massive April 15 fast food strikes that put 60,000 workers on the street across the country. With the struggle for $15 an hour spreading to more cities with a higher proportion of low paid workers, critics can no longer claim that $15 can only be won in cities with a relatively higher paid workforce like Seattle and San Francisco. Gains in economically and racially diverse cities like Los Angeles demonstrate that it is possible to win $15 in every major city across the country. 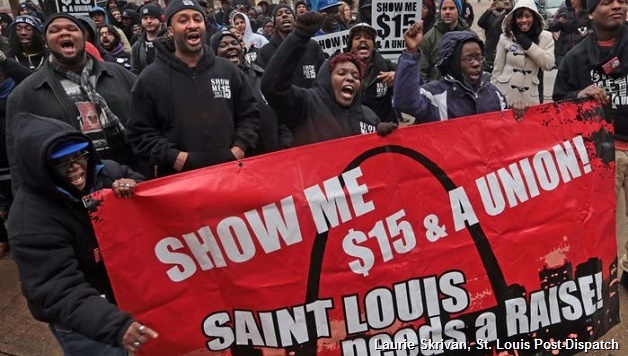 On the heels of the Los Angeles legislation, St. Louis Mayor Francis Slay presented a $15 minimum wage proposal to the City Council. There is no doubt the Democratic political establishment is reacting to the Black Lives Matter movement. The fast food strikers in St. Louis and Black Lives Matter have linked the struggles against police brutality and poverty in the black community in Missouri, pushing the Democratic establishment to respond following the Ferguson protests. The Missouri business community and the GOP are already pushing back hard to pass a statewide ban on municipal wage hikes. In response, Democrats are racing to pass a local minimum wage hike before the August deadline the Chamber of Commerce is pushing for. We know, however, from our experience in Seattle that we cannot rely on Democratic party leaders not to bend to pressure, so urgent mass working class mobilizations are needed in Missouri to win the strongest possible law by the August deadline.